There’s an old puzzle involving four chess knights, two black and two white, in the corners of a 3×3 board. 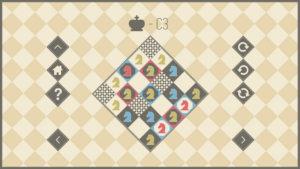 Making only knight moves, you’re supposed to swap the positions of the black and white pieces. The key to solving it is to think in terms of the topology of how the squares are connected by knight moves instead of the geometry of the board. To a knight, the center square is unreachable, and the other eight are each connected to exactly two others, forming a single loop. Swapping the knights is as simple as having them chase each other around that loop halfway. Knights is essentially a generalization of that puzzle. 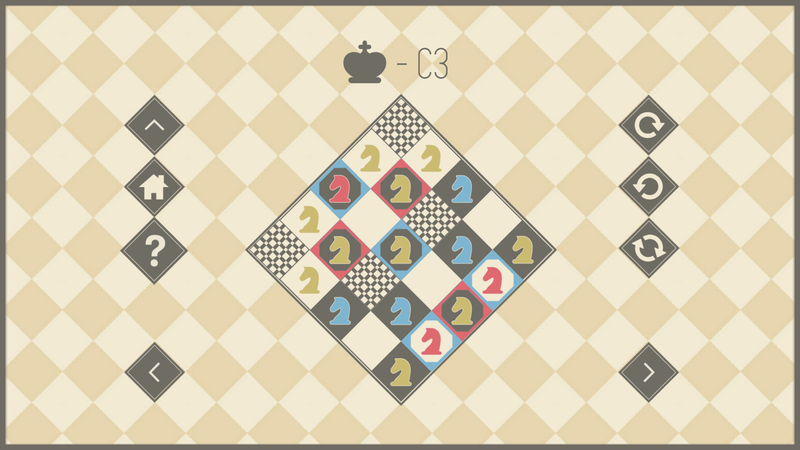 In each level, you have a board with some red and blue knights on it, and have to move them to target squares of the same color. Some squares will be blocked off. After a certain point, it introduces a yellow knights, which don’t have targets and only exist to clog things up and get in the way of the other knights. And that’s it for rules. It’s presented in a clean, elegant graphical style that’s immediately comprehensible, requiring not a word of tutorial explanation. While the puzzles are more complex than the Four Knights puzzle, I don’t think it’s a ruleset with a great deal of room for variability. But that’s okay, because the game is also pretty short. It definitely trains your brain up, though. After working through the bulk of the levels, I was seeing knight-move connections far more easily than when I started, even perceiving the relevant topology directly. There are a couple of levels that try to confuse you with yellow knights in places that are completely disconnected from anything that the red and blue knights can reach, but by the time I reached these levels, the ruse seemed laughably obvious in a way that it probably wouldn’t have when I started. The day after finishing the game, I experienced some pretty strong Tetris effect, tracing knight-move patterns with my eyes on the seats around a table and suchlike. Mostly I traced the eight-pointed star that’s the basis of the original Four Knights puzzle. This is a pattern I kept returning to again and again over the course of the game, a sure-fire if tedious method for shifting a knight around short distances without disturbing things elsewhere on the board. Even if seven of the eight spaces in such a ring are occupied, it’s possible to shuffle them slowly around. The later levels tend to interfere with such rings by blocking off squares. This can create dead ends in the connectivity graph, trapping pieces behind a bottleneck until you can consolidate enough empty space to let them free. This, in turn, forces the player to think hierarchically: “I’ve got to get that piece out of the way, but I can’t do that until I can move this piece”, etc. Completing the last level gives you access to the daily puzzles, which, if I understand correctly, are generated procedurally. I’ve only tried these a little, but it seems to me that, lacking a human designer’s sense of symmetry and beauty, the daily puzzles are even more prone to multiple-tiered blockage of this sort. This makes the puzzles take longer to complete, but it doesn’t necessarily make them more difficult to figure out. I suppose there’s a balance to be struck. If things are too loose, if there’s too much empty space and the player has too many options, the puzzle becomes easy, because it’s easy to get things where you want them. If things are too tight, and the player has too few options, the puzzle becomes easy because there’s so little opportunity to go wrong. But then, this only applies once you’ve played enough puzzles to look at things the right way. The original Four Knights problem fits into the too-few-options category, but only if you can see it as a loop. Consequently, when the seasonal sales come around, I have a whole bunch of obscure little indie games on my wishlist, many of them discounted to less than three bucks, some even to less than one. I’ve been experimenting with a rule lately: when I want to buy something on Steam, I have to get everything cheaper than it off my wishlist first, either by buying it or by just removing it from the wishlist. The theory is that if I’m willing to pay $x for a game I want, then unwillingness to pay an amount less than $x for a different game signifies that I don’t really want it. But when the prices reach the sub-dollar range, I’m very inclined to just pay for them regardless, and make up my mind about them by playing them. And so for the past few days, I’ve been spending my leisure time on a sort of smorgasbord, sampling many little delights and feeling no great obligation to stick with any that displease me. I’ll be describing some of the more interesting ones in subsequent posts. So, I powered through the remaining crosswords. There was one puzzle in the non-special crosswords worth noting: it had a gimmick where some of the clues made right-angle bends at the end, starting Across and continuing upward or downward when they hit a black square. As a result, there were Downs that had no clue and no number in the grid, because they were just the continuation of an Across. This is something that needed no special support to accomplish in Games Interactive, because, as we know from the puzzles with bugs, the layout of the grid isn’t strongly connected to the placement of the words in this implementation. The thing is, though, it took me a while to realize that the missing numbers were deliberate. When I saw that puzzle, my first thought was that the grid was simply screwed up, like so many others. 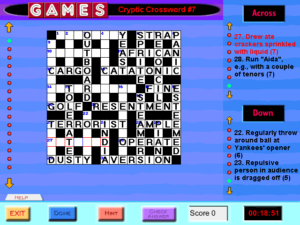 Before moving on, I have one more complaint about the crossword interface even apart from bugs: It doesn’t leave nearly enough room for clues. Very often there’s just two or three clues in each of Across and Down displayed at once, and in the cryptics, where clues are entire sentences, there’s sometimes just one. This happens because it devotes a whole lot of vertical space to headers, including the “Across” and “Down” headers. This is really apparent in contrast to the puzzles that don’t have separate Across and Down clues, such as the Clueless and Helter Skelter. Those fit a decent amount of stuff in at once. Having done all that, all that was left was the Visual section, which I had been leaving as a kind of dessert. The Visual puzzles are quite varied, and mostly pretty playable due to the simplicity of their interfaces, which are mainly based on clicking pictures or dragging them to places. There’s one where you have to arrange a bunch of pictures in chronological order, one where you have to find pairs of matching shapes within a single large picture, a couple where you have a bunch of cartoonish images and have to type in the play on words that provoked them. There’s one where a picture is divided up with a grid, and you’re given several isolated squares that match grid cells in the picture, with the goal of finding the cells that match them. I mention this one in particular because it had a peculiar bug. The instructions said that some of the squares might be in a different orientation than in the picture, and described how I could rotate them by double-clicking. But when I solved the puzzle, all of the squares were right-side-up, making rotation pointless. I just went back to confirm that rotation was in fact implemented, and found that this time, all the squares, without exception, were upside-down. So it looks like they tried to randomize orientations, but wound up picking one random orientation for everything. There’s another that’s odd in that I’m left unsure if it’s buggy or not. 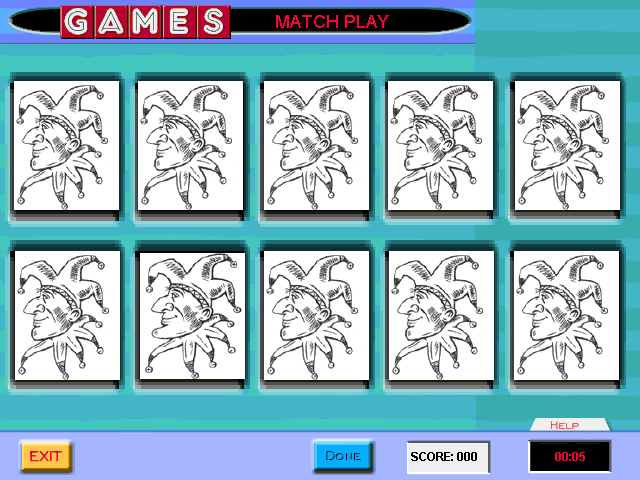 The premise is that ten people were asked to copy a picture of a jester, and only one of them got it right in every detail. The other nine all made mistakes, and you’re supposed to find the one perfect copy by process of elimination. But there’s only one picture that has an obvious difference — and indeed, playing around with the pictures in an image editor confirms that the other nine pictures are completely identical. The one different picture is recognized by the game as the correct answer. Now, there are two ways to explain this. One is that the makers of Games Interactive messed up again. The other is that it’s a trick question. We know that there are nine wrong pictures and one right one, and we see nine identical pictures and one different one, so that one different picture must be the one that’s right. After all, the text of the problem never actually said that the nine mistaken artists made different mistakes, right? I suspect that this was originally published in an April issue, when foolishness of this sort was expected. The jester theme certainly fits. The Visual puzzles are mostly pretty light, but there are a couple of tricky ones based on 3D visualization. I’m pretty good at 3D visualization normally, but one of these puzzles gave me the lowest score of any in the entire collection: -20, which was only possible because of the way it punished wrong answers. Note that this includes a 2x score multiplier because I gave my partially wrong answers so quickly. So anyway, I’ve now played all the puzzles in this game in good faith, even when the game met my good faith with bugs that made things nigh unplayable. That means I’m done with it and never have to look at it again. It hardly seems possible after all these years. Part of the reason I stick with terrible games is a sense that bad games have as much to teach us as good ones, if not more. But honestly, having seen all of this game’s worst, I think it can only be explained as having been rushed to market before the developers were through with it. I mean, there’s basically no way that they signed off on this voluntarily. And that’s a lesson that’s become a lot less applicable these days, now that games are distributed digitally and patched automatically. If this were released in its current state today, it would be in a much better state a week later. Instead, it’s frozen in the form of its pressing. If there was ever a patch available for download, it’s lost to the mists of time due to the ungooglability of the title. [Added a few hours later] The more I think about the jesters, the more convinced I am that it’s a trick question, not a bug. The fact that I was so willing to think it was a bug is mainly just another effect of the prevalence of bugs in the game, just as with the crossword with the right-angle bends. I guess this is a more valuable lesson we can draw from the game: Bugs do harm to the player experience even in parts of the game that aren’t buggy. Once the player is on the alert for bugs, anything unexpected looks like one, at least at first. I’m well on my way to clearing out the Special Crosswords. All I’ve got left is one that’s ornery and one that’s clueless. But to my surprise, there was one, which I solved last night, which was neither. 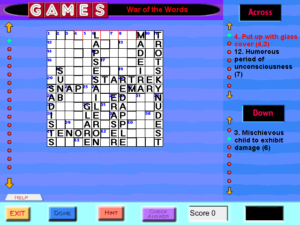 Listed by an individual name, “War of the Words”, rather than by a type, it didn’t have a one-star difficulty rating like the Cluelesses or a three-star difficulty rating like the Orneries. It had two stars. What could it mean? Unlike everything else under Special Crosswords, it comes with no special instructions — just the normal explanation of how to scroll the clues and use the Hint button. This doesn’t mean there’s nothing special about it, it just means that you’re expected to figure out its special features without instruction. It doesn’t take long to discern that it’s a cryptic, just because the clues have that peculiar two-part cadence to them. But the designated cryptics have instructions about how to solve cryptics, and this doesn’t. I don’t think this is a mistake on the part of the game. I think it’s how it was originally published. And the thing is, a lot of the cryptic clues don’t quite work. Take 23-Across: “Sleep break”. The answer is “snap”. “Snap” is a synonym for “break”, and “sleep” clearly clues the “nap” part, but where does the inital S come from? Not from the clue. It goes against what I was saying about cryptics before, that the clues are self-contained and self-confirming. But in a puzzle like this, where you haven’t been promised anything about the rules, it just means that there’s a rule you haven’t discerned. Spot enough anomalies of this sort and you start to notice a pattern. And that’s a sort of puzzle I adore. In this collection, there’s a bug that seems to be unique to this one puzzle, possibly because it’s in a different format than the rest of the crosswords: it tries not to select Down words. If you have a Down word selected, and you press enter to advance to the next clue, it will instead select an Across clue that crosses it. If you try to switch from Across to Down by clicking on the current square, it just doesn’t work. In most cases, I was able to find an uncrossed letter I could click on to force it into a Down, and once it was there, it obediently let me move the cursor around within that word. But there are some Down words that are crossed at every letter, and that makes them simply unselectable. Fortunately, the very conditions that make this happen mean that you can fill in every letter anyway. Like the Cross Numbers, the Clueless is a form that arguably fits better in the Logic category than Special Crosswords. The basic idea is: You have an empty grid and a word list, and you have to fit all the words into the grid by deductive reasoning and/or trial-and-error. Unlike a conventional crossword, or even a Cross Numbers, the grid is highly asymmetrical, which is probably necessary to make the thing work. As with the World’s Most Orneries, the Clueless puzzles are listed by unique names, rather than as “Clueless #1” or whatever. But it’s easy to tell whether a given thing in the list is Ornery or Clueless, because the Orneries all have a three-star difficulty rating, while the Cluelesses are all rated at one star. I really don’t agree with this rule. Some of the Clueless puzzles are vastly more difficult than others. One of the most useful tools in solving them is that the words come in different lengths, which cuts down on the number of places each word in the list can go. If, say, there are only two twelve-letter words in the list, that makes a very good starting point. But one of the puzzles uses only words of eight or nine letters, and another goes to the extreme and makes all the words the same length, just to take that crutch away from you. As of this writing, I still haven’t solved the latter. It’s the only one I haven’t solved. Having at least attempted all of the Cluelesses, I have to say that I was a little premature in declaring that I had seen the game at its worst. I remember these things having problems, but I don’t remember them being as bad as they seem to be now. There are occasional typos, in both the words in the word list and in the solutions. That’s pretty much a given, considering the rest of the game. But typos in the word lists here are worse here than in other crosswords, because they can prevent you from entering the word into the grid. See, you don’t type the words in. You just click on a word in the list and a space on the grid. And it doesn’t take if the word doesn’t fit with the letters crossing it, even if it would fit if it were spelled right. But the worse part is the Index Out of Bounds errors. When you enter a word, it gets greyed out in the list. Sometimes this makes something go wrong. The list stops displaying correctly, stops rendering at some point halfway down and throws an error whenever that point in the list is visible. This only happens with some of the words in some of the puzzles, and in most cases, it’s recoverable: just go to the next page and it’ll continue just past the point of the error. 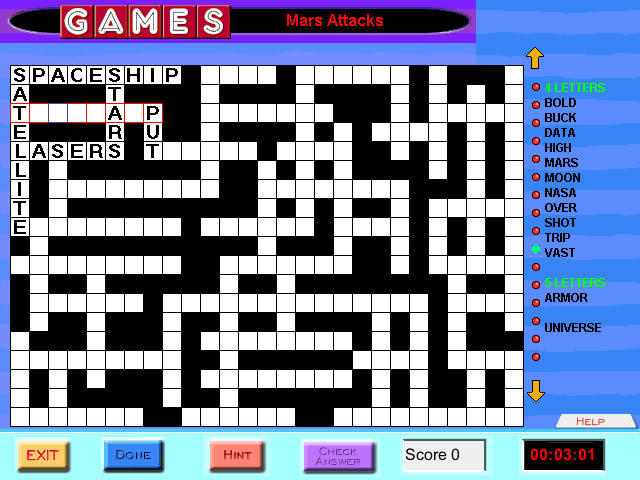 But that isn’t the case for the puzzle titled “Mars Attacks”. In Mars Attacks, the word list is screwed up from the get-go. Click on a word, and it’ll enter a different word, one further down. Early in the list, the word you get is the one immediately below your selection. The gap between selection and result increases every once in a while as the list goes on. On top of that, entering pretty much any word makes it impossible to page to the portion of the list containing that word again without provoking errors that make it impossible to do anything other than quit the puzzle. A rational person would just regard this puzzle as unplayable and move on, but then, a rational person would have given up on the whole game by now. After probing the puzzle enough to figure out the above, I realized that the only safe way to enter the words would be in the order they appear in the list, so that I never had to scroll the list backwards. To do this, I pretty much had to solve the puzzle on paper first. In the better-behaved Cluelesses, I found that using the point-and-click interface to try out ideas was a considerable aid to solving. But never mind, I couldn’t do that here. Once I had a full solution, I had to enter it without any mistakes, and even that took me a few tries. This took a measure of stubbornness well beyond what the game deserves. But you know something? It’s not the most stubbornness I’ve ever needed in a game. Not by a very large margin. The puzzle isn’t supposed to be like this, but the experience is still recognizably ludic. 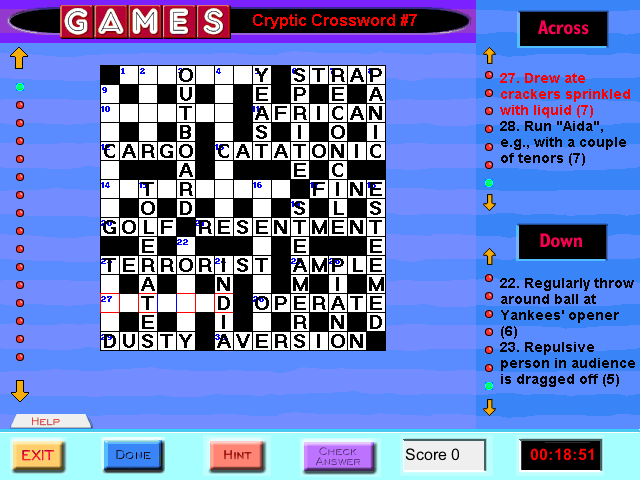 So, with the cryptics down, it’s time to turn to the rest of Special Crosswords. I discover I was mistaken earlier: there are several World’s Most Ornery Crosswords in here. My mistake stems from the fact that they’re not all listed together in the puzzle selection menu. 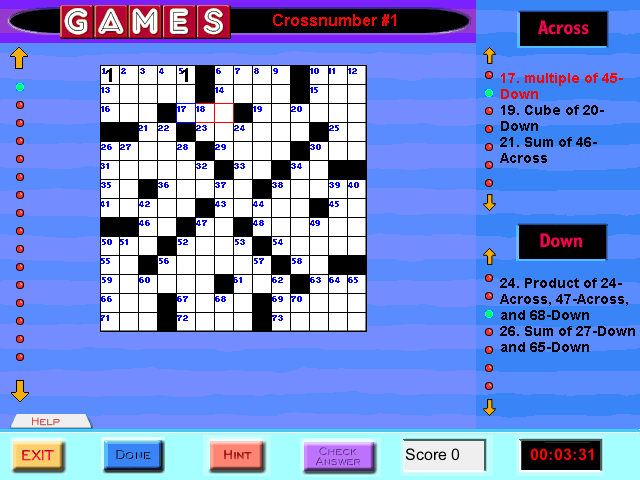 Most puzzles are grouped by type, but that’s because the list is alphabetical and most puzzles have names like “Cross Numbers 1”, “Cross Numbers 2”, and so forth. But the World’s Most Orneries all have individual titles, like “A Manny Splendoured Thing” or “O. C. Can You Say”, alluding elliptically to the theme of the longer clues. Apart from that, there seem to be only two other puzzle types I haven’t described yet. First, there’s the Helter Skelters. There are ten of them here. The idea behind them is that the clues aren’t separated into Across and Down because the words can go in any direction, including diagonals. Each word starts at a number and goes towards the next number, but there’s no indication of where the word ends. This is another of the puzzle types where computerization has a noticeable effect on the experience: on paper, you have to repeatedly pause to hunt for the next number, which is a distraction that can break the flow of clue-solving. These puzzles are on the small side, so it didn’t take long to get through them all. After doing half of them, I actually chose multiple puzzles from the main menu for once, to do the rest in a lump. The only real difficulty is that some of the squares, usually along the edge, have only one word passing through them. I know I’ve seen similar words-going-in-all-directions puzzles elsewhere that came with a promise of two clues per square, but not here. Only one of the Helter Skelters here is severely messed up. 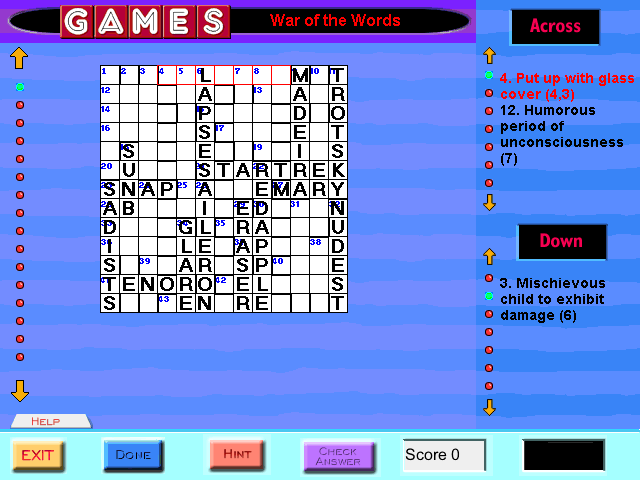 In these puzzles, the cursor normally advances as you type, and does so correctly even on diagonals. But in this one puzzle, the cursor doesn’t advance at all — if you type an entire word, you’ll just repeatedly overwrite the same square. Even navigation with the arrow keys is broken. To enter a full word, I had to click each square with the mouse. And for my pains, I wound up with a score of 0% for that puzzle, because about half the letters in the game’s solution are blatantly wrong to the point of not even spelling pronounceable words. I assume this is somehow connected to the cursor movement problem, but I don’t see how. I suppose that it’s harder to spot major problems like this for a Helter Skelter than for a normal crossword because the actual solution looks like nonsense too until you trace through it. But I’d think someone would have noticed the problem if the game had received any playtesting whatsoever. The other Special Crossword type is the Clueless, which I’ll describe in my next post. I like cryptic crosswords. Not everyone does, but I do. I like the way they make me look at every word in the clues slantwise. I like how they show off the author’s cleverness, and make me feel clever for following their thought processes. And I like the way that the clues are self-contained and self-confirming. When you enter a word into the grid, you know it’s the right answer, because you built up that word out of pieces. Or, well, sometimes you haven’t done that yet; particularly in these computerized ones, where erasure is free and doesn’t leave any marks, sometimes I’ll enter a word that I think is right without a firm idea of how it’s formed, just so I can figure out the rest of the clue by looking at it. But then, if I can’t figure out how it works, I’ll delete it. I’ve seen people who aren’t as hip to the cryptic ways as me fill in answers speculatively, without being able to explain the entire clue, and it bothers me. To do this is to treat it like an ordinary crossword, where you expect to get a few answers wrong at first because the clues are individually ambiguous. This is entirely the wrong mindset for a cryptic. Anyway, I’m pretty sure that Games Magazine is where I first learned to do cryptics, so it’s good to see them represented here. There are eleven cryptics in Games Interactive, and I’ve found them to be the most pleasant thing in the entire collection. Not just because of the content, but because this is the one place where the UI really works. 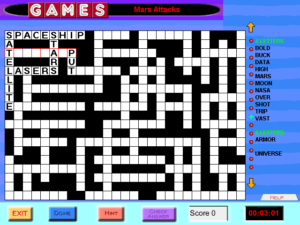 The puzzles are 15×15, so navigating with the arrow keys works properly, and they’re of the “lattice” type, with cross-clues on only half the squares of each word, which means that when you navigate out of the current word, you wind up in a square that has only one word going through it. Thus, it doesn’t keep switching me into an Across clue like the other crosswords. However, true to form for this game, there are some bugs in the data. One puzzle has a misplaced number, with the result that you can’t fill in that word directly — and, unlike in the normal crosswords, the lattice format means you can’t work around the problem by filling in all the words crossing it. One of the official solutions puts an M where there should obviously be an N, creating the words “contemd” and “arsemal”. And one of the clues is “Load one admitted to prying”, which looks plausible as a clue in a cryptic, put which really should be “Loud one admitted to prying”. (The answer is “noisy”: “i” added to the middle of “nosy”.) I’m of two minds about the severity of this. On the one hand, I feel like cryptic clues need to be letter-perfect. On the other hand, I managed to figure it out anyway. As promised, I spent much of the weekend on the two remaining Paint By Numbers sets, acutely aware as I did so that this is not the optimal use of my scant remaining hours upon this earth. But then, neither is whatever I would have been doing instead, so whatever. At this point, I’m pretty sure we’ve seen Games Interactive at its very worst and most grueling, and everything else will be relatively pleasant. Let me talk a little about the process of solving Paint By Numbers puzzles. I usually get started by looking for rows and columns containing large numbers. In the extreme case, you have a run that fills its space entirely — say, you have a 25×25 puzzle and one of the rows is labeled “25”. That happened in one of the puzzles I just did, but it’s not common. More subtly, the numbers might leave only just enough space for a one-space gap between them, like if the same 25×25 puzzle has a row labeled “3 8 4 5 1”. The numbers add up to 21, plus four spaces between them. Most puzzles, however, don’t even have that, and have wiggle room even in their fullest rows. You can’t fill in the row entirely in that case, but you can often fill it in partially. Suppose you have a row “11 3”. If everything is in its leftmost possible position, the first number fills squares 1-11 and the second one 13-15. If everything is in its rightmost possible position, the second number fills 23-25 and the first 11-21. Since the first number fills square 11 in both its leftmost and rightmost positions, it fills it in all possible positions in between. Once you have some stuff filled in, it starts acting as a constraint. The edges of the puzzle are particularly useful, because each square you fill in there nails down the position of a specific run immediately and absolutely. Any time you know the precise position of a run, it carves a space that must be unoccupied out of the perpendiculars at its boundaries, which can alter your analysis of what the leftmost and rightmost possible extents of things are. Often I wind up widening my area of certainty by one square, which allows me be one square more certain in the other direction, and so on in a chain. Now, this sort of logic can be frustratingly slow when you think you know what shape it’s making. It’s easy to say “Of course it’s symmetrical” or “It needs another leg” or whatever. But I prefer to stick to what I can reason out even then, because sometimes things aren’t quite the way you think they should be. They usually are, though, and people who let themselves fill in what they think is right probably wind up solving the puzzles a lot faster than me overall. There is one situation where I tend to use my guesses about the picture, though: correcting mistakes. Sometimes I miscount something, or misread a number, or forget that I already have a square filled in at the opposite side of the puzzle, and I wind up with stuff that doesn’t fit together right. Unlike a lot of logic puzzles, I find I can usually recover from this without starting over completely. I just take one of the contradictory constraints and unravel it: Oh, so this is 10 squares long when the clue says 9? Let’s try erasing it on this end. That makes this other thing too short? Tack another square onto the other end. OK, but how did I decide which end to start with? Probably from my expectations of what the finished picture should look like. After dithering with Cryptics for a while, I finally assailed Cross Numbers 1. It turned out that it contains only nine obviously nonsensical clues. I gave myself permission to use the Hint button without limit on those, but on my first pass with that rule, so great was my habitual reluctance to press that button it that I wound up only using it on one number. It turns out the clues contain a lot more information than is strictly necessary, so having nine clues that don’t really provide any information isn’t as big a handicap as you might imagine. In particular, the ways that the clues reference each other means that you can often apply them in reverse. A clue like “34-Across: Sum of 9-Down and 12-Across” might as well be “9-Down: Difference between 34-Across and 12-Across” or “12-Down: Difference between 34-Across and 9-Down”. Really, the arrangement of the clues, the way that there’s a clue for each number in the grid, is a lie. You don’t necessarily figure out what’s in 34-Across from the clue labeled “34-Across”, and you’re not necessarily finished with that clue just because you’ve filled 34-Across into the grid. Still, in my first pass I wound up with an irreconcilable logical contradiction. I restarted, this time taking hints for all the nonsense clues. I wound up with the same contradiction, but this time kept on going, ultimately getting a rating of 15%, even though the grid was mainly filled in correctly, just because of all the hint penalties I had incurred. Afterwards, I checked the game’s answers against the clues, and found that, as I suspected, my recurring contradiction was the result of a non-obvious mistake in the clues — one where the referenced numbers all exist and have a reasonable number of digits, but the math doesn’t work out as promised in the official solution. This raises an interesting question: Given that there are multiple clues containing mistakes, how can I have any confidence in any of them? The answer is that correct things tend to confirm each other. If I have a number that already has a few digits filled in from the numbers crossing it, and I do some arithmetic to find that number and get an answer that fits the digits in place, that tends to convince me that the clues for both that number and the numbers crossing it are valid. Even better: If I notice a contradiction, and check my math, and find a mistake that resolves the contradiction, that really gives me trust in those clues, because it shows that I can trust them more than I can trust my own thoughts. Because of this, I had a pretty good idea of which of the seemingly contradictory clues would turn out to be wrong: it would be the one with the least confirmation. This turned out to be the case. It strikes me that one could make a puzzle out of this, similar to how diagramless crosswords were, according to legend, originally inspired by an incident where a crossword’s clues were accidentally delivered for publication without a grid. The challenge would be to find the deliberate mistakes in the clues, given that most clues are error-free. To make it easier, you could let the solver know the exact number of mistakes — although if you did that, you could reject solutions that don’t have enough mistakes! Anyway, I’ve tried to figure out what the faulty clues were supposed to be, to see just how badly things went wrong here. It turns out that most of them are pretty close to something reasonable. The most common error, apart from leaving off the second term of a sum, is just mixing up Across and Down. 15-Across: Sum of 3-Across and 34-Down: Should be 30-Across and 34-Across. 40-Down: Product of 48-Across and 70-Across: Should be 58-Across and 70-Down. Finally, the stealth mistake. 16-Across: Sum of 46-Across, 61-Across, and 42-Down: The best I’ve come up with for this is replacing 46-Across with 25-Across. But that’s a relatively unlikely typo, so I’m not really satisfied with this solution. Maybe there’s a better one that has typos in two of the terms. I remember attempting the Cross Numbers puzzles in Games Magazine, but I’m not sure I ever actually solved one. I always found them intimidating. They’re dense tangles of interreferential logic, with clues like “Product of 33-Across and 30-Down” and “Number of 5s in the completed grid”. Such a thing offers no obvious foundation for solving; everything depends on something else, and finding so much as a toehold is difficult. Sometimes you have to notice that you have a couple of digits in a six-digit number that’s clued as the square or cube of some other number and there’s only one square or cube of that length that has those digits in those places. The instructions advise using a calculator. I prefer a spreadsheet. There are two Cross Numbers in the Special Crosswords section of Games Interactive. (I’d have probably have put them under the Logic section, because they’re the sort of puzzle solved through deductive reasoning, but I can understand why they’re classified as they are.) They are positively the biggest mess I’ve seen in the whole game so far. My first inkling that there was something wrong was a clue “Multiple of 45-Down” where there is no 45-Down, just a 45-Across. This turned out to be just one of several clues referring to things that go in the wrong direction. Perhaps it just had the directions swapped in these cases? But no, the clue for 24-Down is “Product of 24-Across, 47-Across, and 68-Down”. There is no 24-Across, and it can’t really be talking about 24-Down because then 24-Down would be itself multiplied by a couple of other multi-digit numbers. Another of the clues is “Product of 48-Across and 70-Across”. Not only is there no 70-Across, but 48-Across has six digits while its alleged multiple has only four. Did they just include the wrong grid or something? Maybe, but that doesn’t explain the even weirder clues, like “Sum of 46-Across”. Sum of 46-Across and what? Maybe it meant to add together the digits of 46-Across? But no, in one place it asks for a three-digit “sum” of a single two-digit number. I suppose that could be explained by the grid being wrong too. But I’m still reluctant to accept this because the other Cross Numbers puzzle uses the phrasing “digit sum” for such things. When I looked at the second puzzle, it was mainly to see if the two puzzles simply had each other’s clues. It turned out that the second puzzle doesn’t have the problems of the first, and is actually in solvable condition. It does have some problems, though. There’s a square erroneously colored black: you can move the cursor into it and presumably type a number, but you can’t see what you typed. 62-Down is shown in the wrong place, in the middle of 56-Down, with amusing consequences for navigation. The clue for 88-Down is missing, resulting in an “Index Out of Bounds” error dialog if you select it in the grid. Fortunately, the game recovers gracefully from this. I did solve the second puzzle — a possible first for me, as I’ve said. The game rates my solution at 88%, but I trust my reasoning more than its judgment. I haven’t entirely given up on the first puzzle either: it’s possible that its nonsense can be overcome through copious use of the Hint button.